A pyramid of laws governs all associations. It is important for board members to realize that this pyramid and its hierarchy exists. At the base of the pyramid, with the widest application, is the United States Constitution. A board member must be aware that the United States Constitution applies to the association and its operations. As an example, the United States Constitution states that persons may not be deprived of their property without due process, which means a notice and a hearing. Some associations have administrative enforcement assessment procedures (fining) in their rules. These procedures must mandate the availability of a hearing before a penalty may be assessed. The necessity for the hearing is a result of the due process clause of the United States Constitution. Next on the pyramid are the many Federal laws. For example, Federal tax laws apply to all associations and require a tax return to be filed every year. In addition, fair housing laws apply. These laws prohibit discrimination not only based upon race or religion, but also prohibit discrimination against children and the handicapped. With the limited exception for federally designated “senior housing,” an association may no longer be “all adult” and signage such as “Children Prohibited From Playing” must be removed. State laws are next on the pyramid. Ohio’s statute pertaining to condominiums and homeowner associations (“planned communities”) are located in Revised Code Chapter 5311 and 5312 respectively. In addition to Chapters 5311 and 5312, Ohio has other laws that also apply to community associations. For example, Ohio also has a law pertaining to towing vehicles from private property that dictates the language of the sign that must be at the entrance to the property before a vehicle may be towed. Next on the pyramid are Municipal laws. 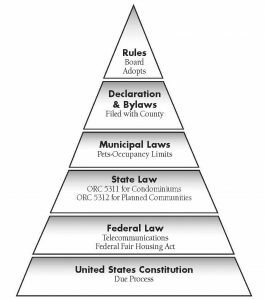 Note that the Municipal laws are more narrow on the pyramid because they are more narrow in their applicability. Municipal laws only apply in the particular municipality in which the property is located. They vary from municipality to municipality. For example, many cities have pet ordinances. These ordinances often mandate that dogs must be on leashes. A board may make use of municipal laws by enlisting the help of the police or building department to remedy a problem on the property. Above the Municipal laws, and having a more narrow application to a particular association, are the Declaration and Bylaws. These documents establish the authority of the association. The Declaration declares the deed restrictions on the property. The Bylaws (also known as the Code of Regulations) define the internal operations and procedures of the association. Neither document is written in stone. They may be amended by a vote of the owners. There are numerous types of amendments that a board can consider. Some associations are completely rewriting their governing documents. Others are amending provisions relating to such topics as leasing, pets, and collections. If your documents are deficient, do not hesitate to amend them. The top tier on the pyramid consists of board promulgated rules. Every association should have a clear, concise rule booklet. It is imperative that board members realize that board rules must not contradict the Declaration and Bylaws. If the Declaration states that an owner may have dogs, a board may not pass a rule that says “No Dogs.” The same principle does not allow Municipal law to contradict the State law and the State law to contradict the Federal law. It is important that all board members be aware of the applicable laws. Prior to acting, it may be wise to review the pyramid of laws to determine if the act falls within a certain category and to ensure that the board is in compliance with the applicable law.